Product prices and availability are accurate as of 2019-04-11 07:43:20 EDT and are subject to change. Any price and availability information displayed on http://www.amazon.com/ at the time of purchase will apply to the purchase of this product. Videotapes can deteriorate over time. Your old videos will have color bleed, white specks, and other distortions. Don't risk this happening to your home video collection! 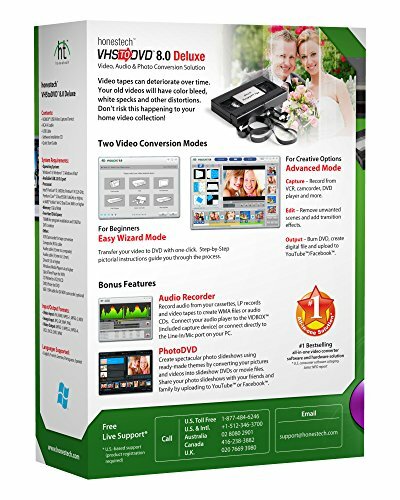 VHS to DVD 8.0 Deluxe provides everything you need to easily convert your videos to digital formats. 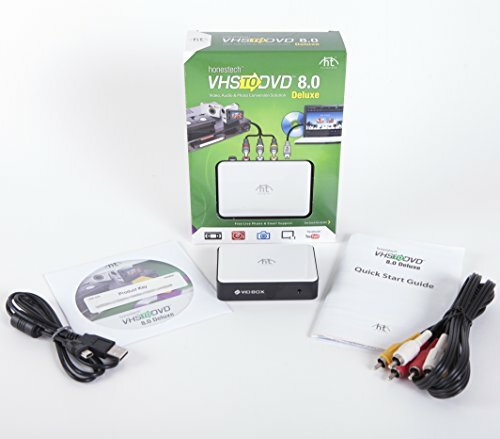 All you need is a VCR and a PC with a DVD burner and, with VHS to DVD's Easy Wizard Mode, you can transfer your video to DVD with one click. Step-by-Step pictorial instructions guide you through the process. 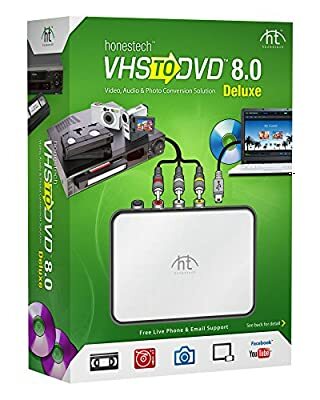 For more creative options, VHS to DVD 8.0 Deluxe's Advanced Mode lets you capture video from analog or HDV/DV camcorder, VCR or DVD player and more. You can also edit unwanted scenes and add transition effects, burn DVDs with custom menus, convert video formats for iPhone, iPad, and Android devices. When you're ready, you can upload video to YouTube or Facebook with one click. More, you can capture still images of scenes from your video. To revive old music, use the included Audio Recorder software to convert audio from cassettes, LP records, and video tapes to create WMA files, or audio CDs. The newly added Photo DVD allows you to create spectacular photo slideshows using ready-made themes by converting your pictures and videos into slideshow DVDs or movie files.